Under the Flores sea around the Komodo islands are some of the best diving and snorkeling sights and experiences in the world. Our Komodo snorkeling safari gives a glimpse of this magic under-water world and shows some of the great biodiversity of fish, corals and sponges of this area. We do much more than overland tours! Our passion for Indonesia extends beyond the islands themselves. We are all passionate snorkelers and several of us are also free-divers. We offer incredible guided Snorkel tours of the Komodo National Park! Our staff introduce you to some of the most beautiful snorkeling sites in the world. While we offer one day trips to for snorkeling or snorkeling and visiting the Komodo Dragons – the real treat is our overnight trips. We will also be offering overnight snorkeling adventures beginning in May 2015. These will only be in small groups with all the safety and service you have come to expect from Wicked Adventures. All of our snorkeling activities are designed for the entire family. 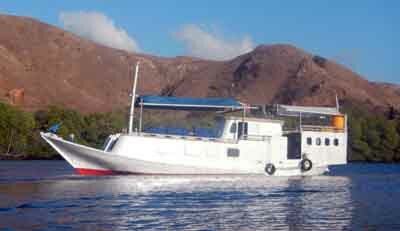 With the small groups and highly trained staff – the reefs of the Komodo National Park are yours to explore at leisure. Please be aware that you may come for two days and stay for 5! Our snorkeling equipment is all new and of very high quality. Visits to see the Komodo Dragons can be arranged, but the marine life is so intoxicating and the sailing schooner is so pleasant that that you may just forget about the land creatures all together. Should you wish – we also have a budget boat available for charters – perfect for a family or those seeking a private overnight trip.